Name borne by three Biblical personages. 1. Son of Hilkiah; appointed successor of Shebna, the "treasurer" (R. V. "scribe," margin "secretary") of Hezekiah (Isa. xxii. 20 et seq.). The office to which he succeeded is described as (= "over the household"), according to Delitzsch and others a "major domus" (comp. I Kings iv. 6, xvi. 8, xviii. 3; II Kings x. 5, xv. 5), the incumbent carrying the title , connected with the Assyrian "saknu" (a high officer: Cheyne, "The Prophecies of Isaiah," ii.153). This designation occurs also in the feminine form (= "caretaker"), used of Abishag (I Kings i. 2, 4), and it is met with on a Phenician inscription ("The Soken of the New City": "C. I. S." I. i. 5; Hastings, "Dict. Bible," p. 685b).Eliakim is clothed with long tunic and girdle: the key of the house of David is laid on his shoulder (comp. Rev. iii. 7), and he is proclaimed "father of the people." According to R. Eleazar ben Pedat, "tunic and girdle" were the insignia of the high priest's office (Lev. R. to v.). But R. Eleazar does not regard "soken" as a title. From the double form "soken" (masculine, Isa, xxii. 15) and "sokenet" (feminine, I Kings i. 2) he concludes that Eliakim's predecessor was a "sensuous" man ( : Sanh. 26b). At the invasion of Sennacherib (II Kings xviii. 18 = Isa. xxxii. 3) Eliakim appears as the chief diplomatic emissary of Hezekiah, while Shebna is mentioned as his secretary. Eliakim sprang from a family of no social standing: his elevation to dignity conferred distinction on his "father's house" (Isa. xxii. 23, 24). Some commentators have construed the words of the prophet to imply a resentment of Eliakim's nepotism as bound to end in the downfall of the family. But nepotism is so common at Eastern courts that it would be strange for Isaiah to advert to it specifically. 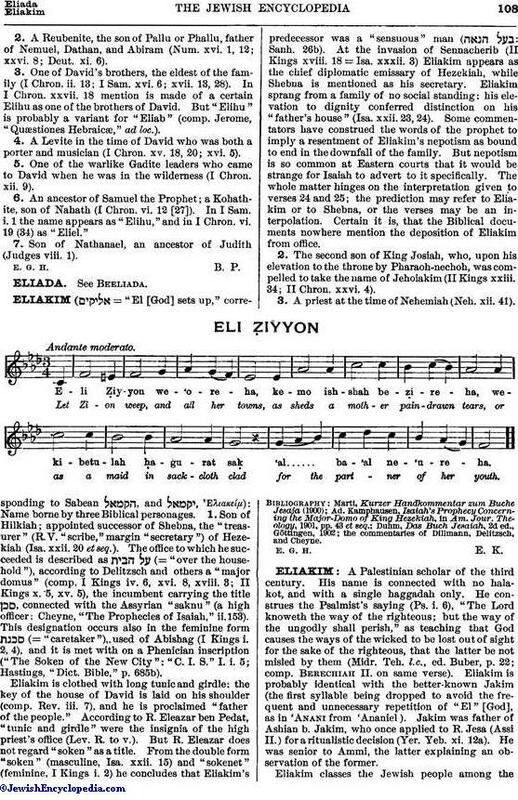 The whole matter hinges on the interpretation given to verses 24 and 25; the prediction may refer to Eliakim or to Shebna, or the verses may be an interpolation. Certain it is, that the Biblical documents nowhere mention the deposition of Eliakim from office. 2. The second son of King Josiah, who, upon his elevation to the throne by Pharaoh-nechoh, was compelled to take the name of Jehoiakim (II Kings xxiii. 34; II Chron. xxvi. 4). 3. A priest at the time of Nehemiah (Neh. xii. 41). the commentaries of Dillmann, Delitzsch, and Cheyne. E. G. H. E. K.